Review: It’s been a long while since I’ve seen the film version of Dr. Giggles, so I thought I’d check out the comic adaptation. 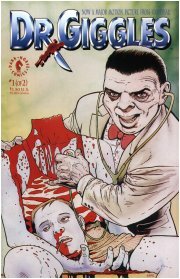 For those of you not familiar with the film, Dr. Giggles is about a doctor (played by Larry Drake) who kills people with various medical implements. There’s more setup than that, but that’s the gist of the story. The comic captures the rest of the story nicely, but it still manages to gloss over quite a bit in order to fit the entire thing into two issues. Overlooking some of the story is not that big a deal when it comes to horror movies. Most often, the most notable part is the actual kills, especially in the case of Dr. Giggles. The man had a unique tool for everyone, and he had at least one delightfully cheesy one-liner to go with each kill. The one-liners are carried over from the movie, but any kind of amusement you’d get from them is diluted by the brisk setup and breakdown of all the kill scenarios. Larry Drake’s likeness is not altogether bad, though a bit cartoonier than in the film. Unfortunately, as you read his dialogue in the comic, you’ll quickly realize how boring it is without his memorable delivery. Nowhere is this more apparent than with Dr. Giggles’ infamous laughter. Drake’s high-pitched, manic laughter was a hallmark of film. That sort of thing just just can’t be translated to a written medium, assuming the author doesn’t want to put “(laughs like Larry Drake)” in a speech bubble. What’s more disappointing, though, is that a few of the doctor’s more interesting kills are abridged, or just plain skipped over. For example, in the film he dispatched a woman by switching out her medication with some form of poison, and then drove the point home (literally) by shoving a thermometer into her brain. 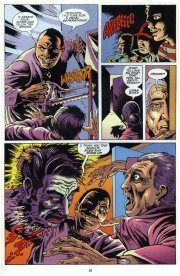 If you’re reading the comics, however, all you get is said poisoned woman barfing up some kind of blue liquid, as though Dr. Giggles had killed her with a blue-tinted Alka-Seltzer tablet. 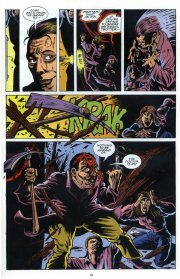 Again, I understand that all this had to be crammed into a mere two issues, but why leave out the kills in a horror movie? Art-wise, I can’t really complain. Every once and a while, Dr. Giggles will start to look like Peter Lorre’s older brother, and he does seem to strike a lot of strange poses, but these seem to be the artist’s way of closing out scenes that end abruptly thanks to the abridged script. The real purpose behind the comic seems to be to drive people to see the movie. I encourage you to do so, and skip the comics. They’re more of a “Dr. Giggles Lite”. Then again, I suppose that comics based on movies may not be all that great. I have NEVER laughed to hard with my ex-girlfriend than when the titular character exclaims in a Shakespearean manner upon dying - "Is... there... a doctor in the house?" His voice, facial expression, the absurdity of the moment had us rewinding the scene over and over and over again. I really thought I was going to die. I've never even heard of this movie. It sound interesting.